IJmond has developed into the Dutch seaport par excellence when it comes to fish. A great many leading international companies have established bases along this cost-effective and flexible supply route, transforming IJmond into an international industrial centre. As a result, IJmond functions not only as an entrance gate to Amsterdam but also as a full-fledged economic hub on its own with a dynamic and multifunctional seaport! In 1876, the North Sea Canal was opened, leading to the development of IJmuiden as an important residential and working centre. IJmuiden grew quickly and - somewhat unexpectedly - this resulted not from large-scale shipping traffic but rather from the discovery by the offshore fishing sector that the harbour offered excellent and very safe facilities for their fishing boats. At the end of the 19th century, the government built a harbour area and made it available for the fisheries sector, an area that later became the location of the national fish auction. By now, IJmond has become one of the most important fishing ports in the Netherlands. 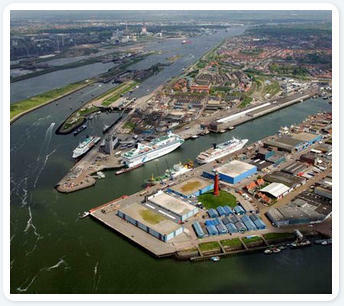 In 1989, the Staatsvisserhavenbedrijf (National Fisheries Harbour Area) became an independent company: Zeehaven IJmuiden N.V. The construction of the North Sea Canal had another unexpected consequence. Various industrial players soon discovered the opportunities offered by this cost-effective and flexible supply route. It didn't take long before Velsen became a preferred location for various companies, which soon transformed it into an international industrial centre. International companies such as Corus IJmuiden, Crown van Gelder, DSM, ENCI and NUON play an important role in IJmond to this very day.